Monthly training held for users of TraceGains products and TraceGains Network. Whether you are new or just need a refresher, these webinars train you on the essentials, teach you tips and tricks, and give you real-time Q&A with our subject matter experts. In this webinar, Eurofins scientist Tim Lombardo will review the top “at risk” supplements, as well as the increasing availability of CBD infused “supplements”, and the current FDA position for each. Food Regs 101 cover the basics of Food Regulations so your employees don’t have to struggle to learn about food regulations the hard way. FDA attorney, Marc Sanchez discusses the primary regulatory agencies in the U.S.; what is regulated and why; sources of law; and practical suggestions to put regulatory knowledge into practice. In this on-demand webinar, AIB instructor Earl Arnold discusses and compares industry best practices with regulatory requirements and make suggestions on how to prevent developed mitigation strategies from being compromised. This webinar is co-sponsored with AIB International. In this on-demand webinar, Nancy Scharlach discusses roles of responsibilities of the PCQI team leaders. 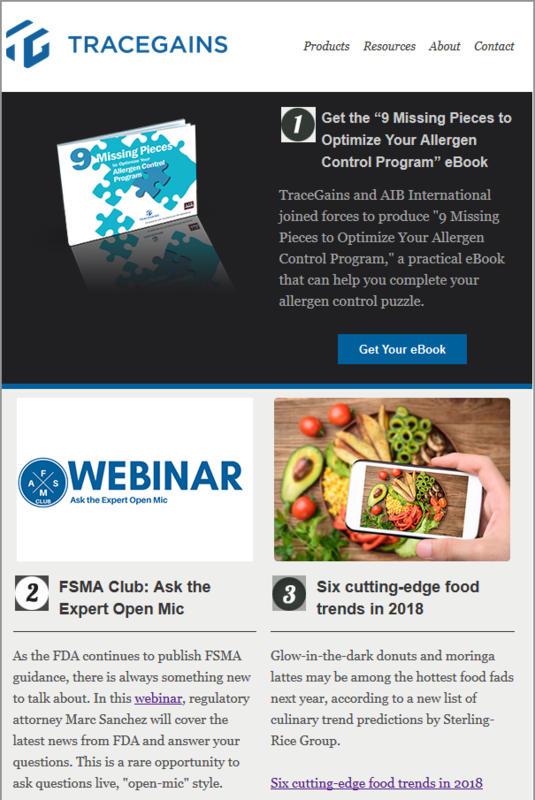 She covers the differences and similarities between HACCP and FSMA Preventive Controls, how FSMA PCs are more to manage, and what your company needs to do to ensure you have a successful cross-functional PCQI team. In this on-demand webinar, Lumar Food Safety Services consultant Nadia Narine discusses the changes made to BRC Global Standard Issue 8 that was published in August 2018 and will be audited throughout 2019. She discusses what the auditors will looking for and ways to ensure businesses stay compliant. This Solution Spotlight highlights TraceGains' Audit Management (AM) - the only network connected SaaS-based audit management system in the industry. Audit Management digitizes and streamlines the audit process for all facilities and suppliers. With an optimized interface, users can schedule, conduct, and track audits on a single platform with any device. Watch this demo to see how you can decrease audit time by half! This Solution Spotlight highlights TraceGains' Customer Management Standard (CM) solution. The CM module provides you visibility and control for all your customers' data. Want the Broker/Distributor PassThru™? Then you need Customer Management Standard! This Solution Spotlight highlights TraceGains' Supplier Compliance (SC) product and demonstrates how to use the module for real-time data on your supply chain. Learn how SC acts as your early warning system and extends visibility across from purchase orders, to production, all the way to your suppliers' shipping docks. This Solution Spotlight highlights TraceGains' Quality Management (QM) module and demonstrates how the software offers dynamic insights into your plant floor. Whether you're focused on maintaining compliance with FSMA or other regulatory guidelines, responding to customer audits, or complying with GFSI-certified programs, you can easily handle it with TraceGains' QM software. View our webinar archives here!